The video that shows a Black teenager being thrown across her classroom by a police officer points to uncomfortable truths about how many schools see disciplinary problems as criminal behaviour. And those tracking the numbers say the system is creating a school-to-prison pipeline. Research shows black girls are disproportionately disciplined, at a higher rate than black boys and white students and some say this facilitates to the school-to-prison pipeline. It's not the kind of scene you expect to see a classroom. But there it is. 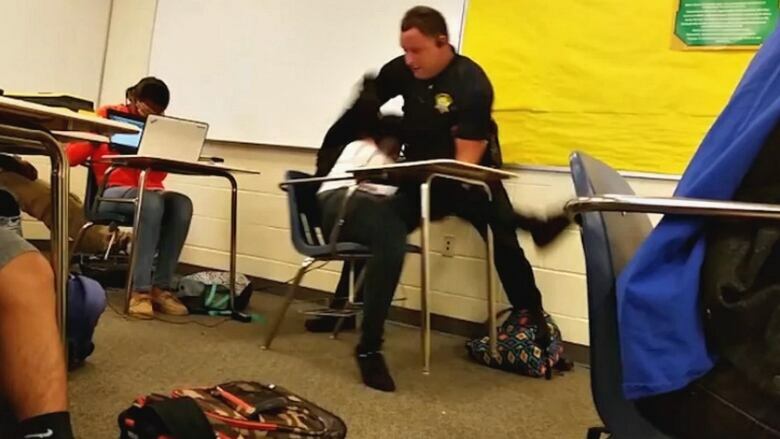 The violent arrest of a female, African American student in a South Carolina high school. The white, male police officer nearly throwing her across the room. We haven't heard from the student in question. In fact, we don't know her name... just that she's 16-years-old. But we have heard from her classmate, Niya Kenny, who captured it all on video. After taking the video, and speaking out Niya Kenny was also arrested by the same officer, known as a School Resources Officer. Both girls were charged with -- quote "disturbing schools." Niya Kenny was released Tuesday, on a $1000 bond. Ben Fields, the sheriff's deputy and "school resource officer" who made the arrests, has been fired. Both the FBI and U.S. Department of Justice have launched investigations into what happened. But the entire incident leaves some big questions... about the role of police officers inside schools. Mo Canady is the Executive Director of the U.S. National Association of School Resource Officers. He joined us from Hoover, Alabama. Kimberlé Crenshaw is the executive director of the African American Policy Forum and a professor at Columbia Law School and also at UCLA. She was in New York City. This segment was produced by The Current's Pacinthe Mattar, Erin Pettit and Ines Colabrese.